In 2012 Main Street Music Lessons started its rental program to students and select schools (Lewiston Public Schools, Saint Dominic Academy, et. al). 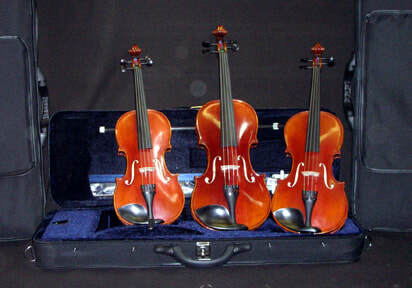 We offer string instrument rentals from acoustic/electric guitars to violins, violas, and cellos to students of MSML as well as surrounding school music programs. Our rental agreement currently asks for two month's fees to initiate ($30.00- $60.00 depending on the instrument), or payable by cash, check, or ATM/credit/debit card (in person). We have a number of instruments available for many different-sized learners and suggest we meet the student to properly match the student with the instrument. After the initial two-month payment is made, payments are to be made monthly. Fees may be paid in advance at any time. As always, terms of rental are subject to change as we grow. We ask that you bring in your rental from time to time so we may keep your instrument in optimum condition. If you plan to rent your instrument over the summer, a payment of three months must be made prior to the end of the school season. Rental customers must be current students of MSML or an active school music program.